Christchurch Square, New Years Eve. Close up of "the diamond". 18 PDP screens, 4 strobes, and a 1m mirror ball made up a unique look for this years event. Rotorua Wearable Creations 'n Colour Awards. View from FOH. 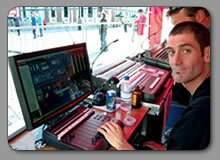 Lighting and media servers controlled by Steve Renwick, with a Martin Maxxyz Console. 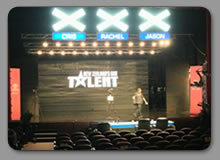 Technical production by Dynamics AV. Rotorua Wearable Creations 'n Colour Awards. Perfectly synched video and lighting. 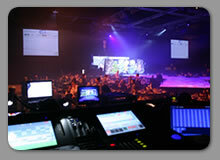 One of our DMX systems was also used as a backup to the lighting console, running Martin Maxxyz PC and Show Designer software in parallel. View of FOH. 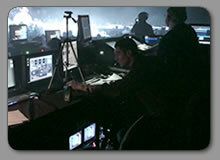 Pictured Will Smart, taking a break from programming visuals for each song. 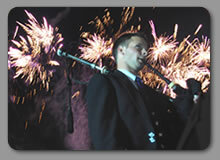 Piping in the New Year. Accompanied by a bit of pyro. Christchurch Square, New Years Eve. 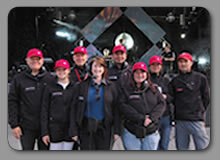 The Christchurch City Council events team ensuring Christchurch events run smoothly. Tourism New Zealand Stand. 4 by 3 curved plasma wall. 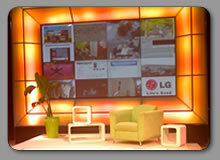 This is an example of recessing a plasma wall into a design-build structure for a tradeshow or expo. Any size, or arrangement of panels is possible. 2Tube Television Show. 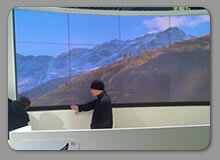 4 by 4 plasma wall with sixteen different video sources crossfading into one image. 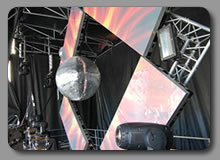 The surround was lit by martin stage bars. 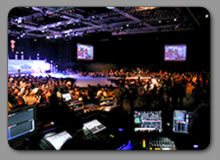 Last years' event, view from behind front of house. NZGT13 Regional Finals. Battling the reflective flooring, The screens are blank except for the logo graphic. The texture visible is just light bouncing off the floor surface. NZGT13 Regional Finals. 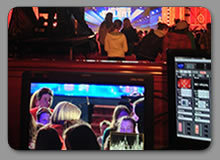 We use production-grade HDSDI monitors with waveform and vectorscope functions at FOH to help give us accurate and consistant colour and luminosity values for camera. Copyright 2009 PhasedMedia, All rights reserved.